Community.kde.org is the working area for the KDE community. It provides a place for sharing information within the community. Welcome to community.kde.org. Here you will find information for members of the community, including how to get involved if you aren't already. Note: before editing the wiki, look at Help:Contribute#Organisation to see where to add content. Information useful across many projects, or for the KDE community as a whole. New to KDE? If you want to start contributing, start here. Policies covering development of KDE software. Upcoming freezes and release dates for KDE's main products. 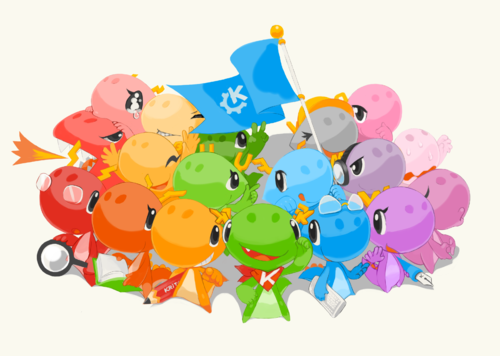 Conferences, sprints and other events in KDE, including Akademy. Infrastructure provided for KDE projects, such as source control and systems for translators. Guidelines for creating good software, and helpful information for contributors that is not project-specific. Keynotes and presentations by the KDE community. These teams work on areas common across lots of projects, sharing their expertise and working on tasks that individual projects often don't have the resources to manage on their own. These are pages for specific projects. These can be pieces or collections of software, specific websites or other relatively self-contained areas of work. These are groups that come together based on shared experiences, rather than because they are working on the same thing. This page was last modified on 27 March 2019, at 10:36. Content is available under Creative Commons License SA 4.0 unless otherwise noted.